These sterling silver Claddagh stud earrings feature hearts that are accented with inlaid Connemara marble. Sorry, these earrings are sold out. The Connemara marble that is featured in these Claddagh earrings is the only natural green marble in the world; fittingly, Connemara marble is only found in Ireland. These sterling silver Claddagh earrings feature Connemara marble inlaid in the hearts. The Connemara marble Claddagh earrings are studs with butterfly backs that measure 1/2" wide x 1/2" tall. 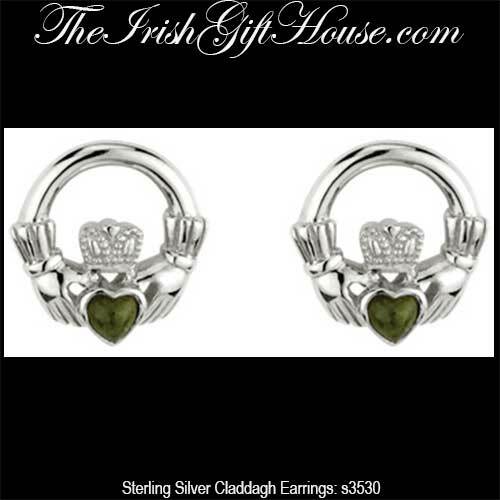 The Irish stud earrings are gift boxed with Claddagh and Connemara marble history cards, complements of The Irish Gift House; they are made by Solvar Jewelry in Dublin, Ireland. These Connemara marble earrings have been hallmarked sterling silver by the Irish Assay Office at Dublin Castle in Ireland.